Increase your productivity! 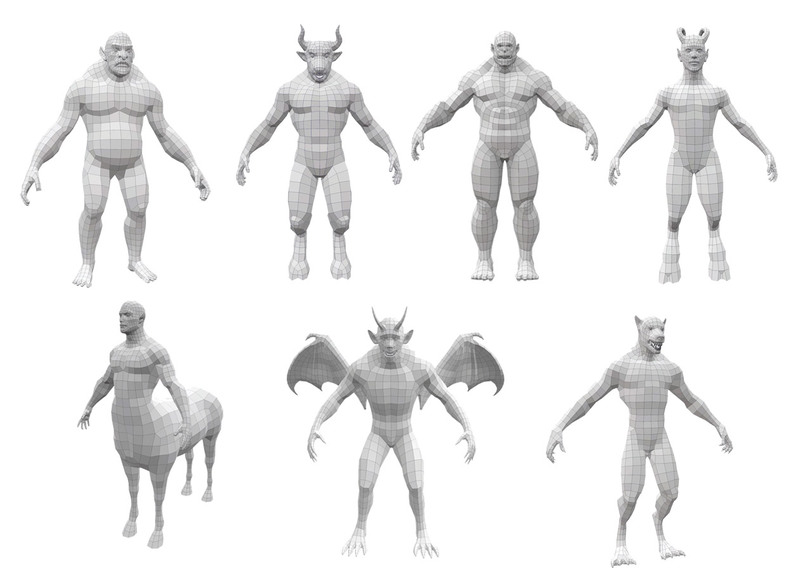 A good base mesh allows you to save time with good proportions, clean topology and opened Uvs. You get a head start saving time avoid to create a model from 0. 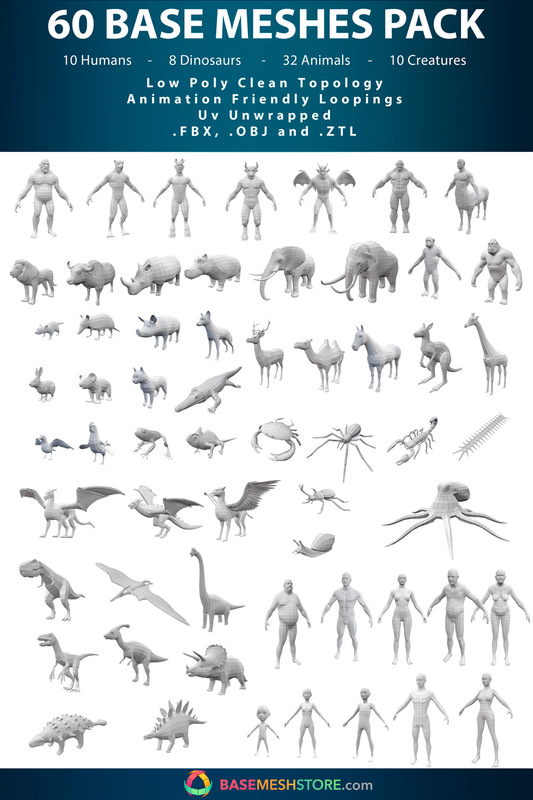 Huge Quantity: 10 Peoples, 32 Animals, 8 Dinosaurs and 10 Creatures. High Quality: Created by artists for artists. 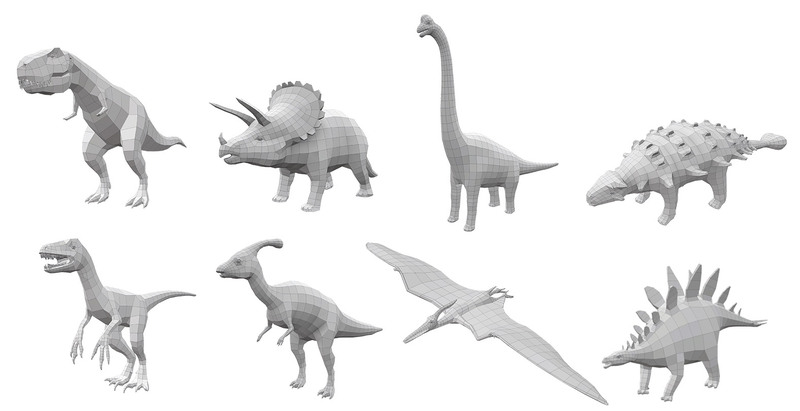 Each one was carefully made to better attend the necessity of a base mesh: Polygons just where necessary, loopings on deformation areas and good unwrapped Uvs! Cheapest: Less than 5% of the price would you pay. 5 Realistic proportions: 2 fit adults, 2 old peoples, and a Fat man. 15 big Animals: Buffalo, Camel, Chimpanzee, Elephant, Deer, Crocodile, Deer, Giraffe, Gorilla, Horse, Kangaroo, Lion, Mammoth, Octopus, Pig, Rhino, Roster, Scorpion, Spider. 12 Tiny mammals: Armadillo, Charmeleon, Crab, Fox, Frog, Pig, Pigeon, Rabit, Roster, Koala, Cat, Rat. 5 Insects: Conch, Beetle, Spider, Scorpion, Centipede. Ankylosaur, Brachiosaur, Parasaurolophus, Pterodactyl, Stegosaur, T-Rex, Triceratops, Velociraptor. Each model is sold for 10$ at 30$ taking the average of it, 60 base meshes will cost more than 1,000$. Now you can it buy for just 60$. This is the best offer of base mesh you can buy on the whole internet! This item has an average rating of 5 from 3 ratings by the community. So there is a little problem, as Im a little noob overall not having blender file for Orc and have to Import it from FBX and OBJ to Blender its making a little problem for me, trying to figure it out but still.. It's looking like the texture and even in Edit Mode it's look not as usual in Blender..
Could You provide me with clear Blender file for Orc please? Hello, Thank you for your feedback. You are right, the Orc is missed in .blend file. I have just updated the product with the orc.blend file and you can download it. If you prefe, you can also provide me your email, so I can send to you just the orc.blend. This library of base meshes is really worth the money. 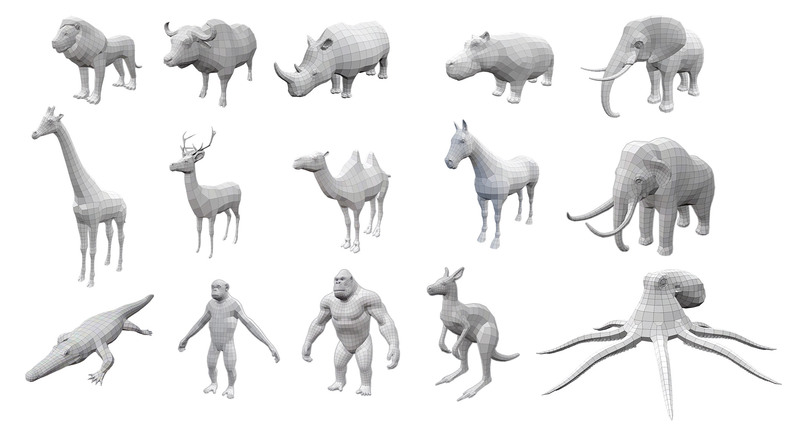 You‘ll receive a ton of different base meshes, ready for sculpting and you can use them aswell for retopology. The only negative thing I have to say is that the topology for hands isn‘t that good. I use the male base mesh pretty often. Specially the fingers need some more work here (the topology is not suited for bending the fingers). But despite these smaller issues, the meshes are still pretty good and generally they have a good topology. But I still rated this library with 5 stars because for this price I can live with some minor issues pretty well. Overall the topology is still pretty good and this library can save a lot of time and hard work. Hey, I'm glad that you overall like the base meshes. I will consider your feedback about the hand's topology in an update. Thank you for your feedback. Take care!